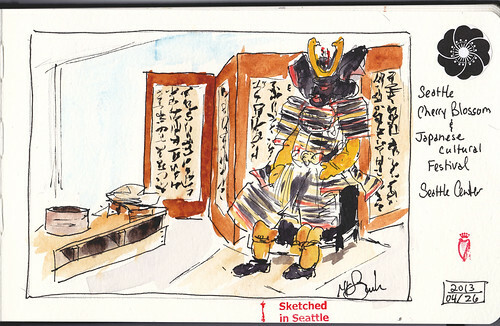 A few members of Urban Sketchers Seattle gathered for an ad hoc sketch outing today at Seattle Center. Just starting today was the Cherry Blossom and Japanese Cultural Festival. I traveled in by light rail from the southern hinter land. I got to Westlake center rather earlier than I thought the Seattle Center Armory would be open. Since it was chilly outside still, I decided to shelter at Westlake and do a sketch out the window of the buildings over the plaza. I liked the greenery at the top of one of them. 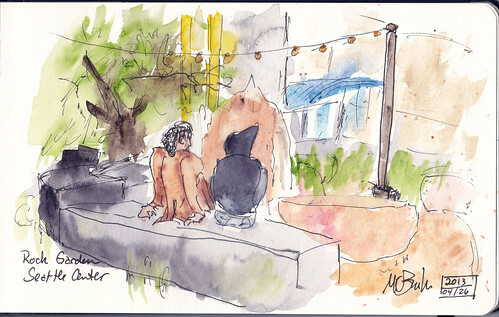 Once at the festival, I thought I should do at least one sketch on the topic of the day. This is a set of samurai armor posed. I found this small rock garden next to the Armory. A couple people stayed fairly still in close conversation. 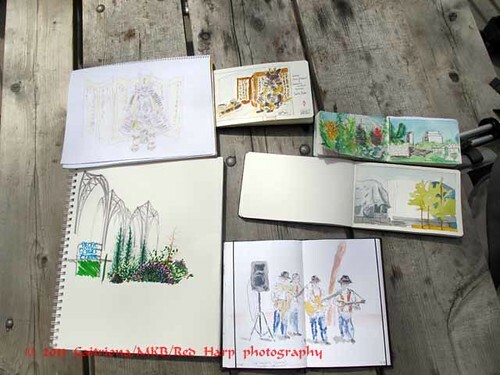 We gathered again, as usual, to share out sketch books. 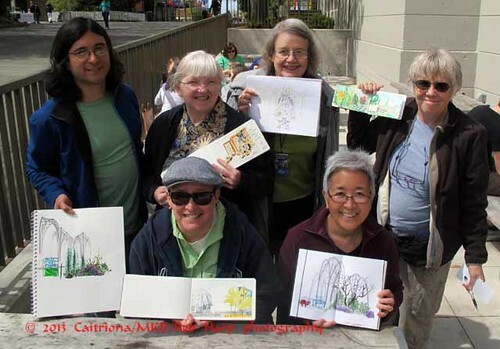 seated: Lynn, Tina; Standing: Ken, Kate (me), Nancy, Sue (it was her first time with USK!). Photo by Gordon.